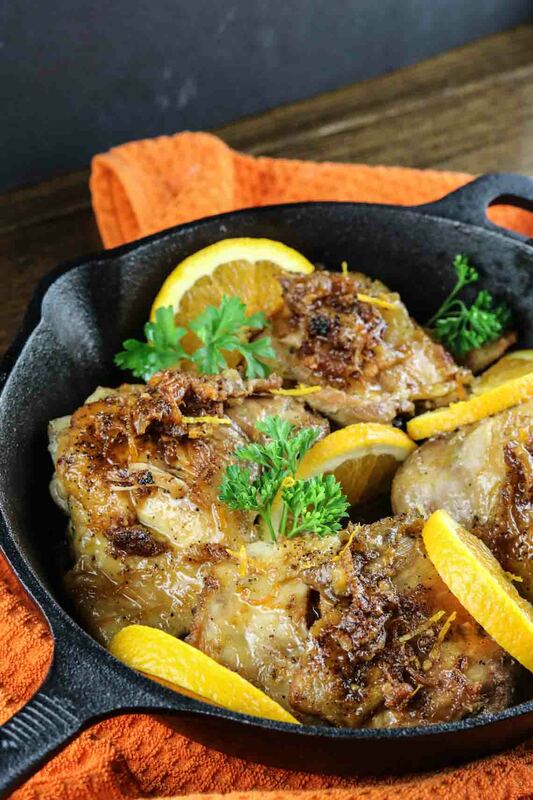 This orange glazed skillet chicken is a spin on the crackling’ chicken a shared a few weeks ago. 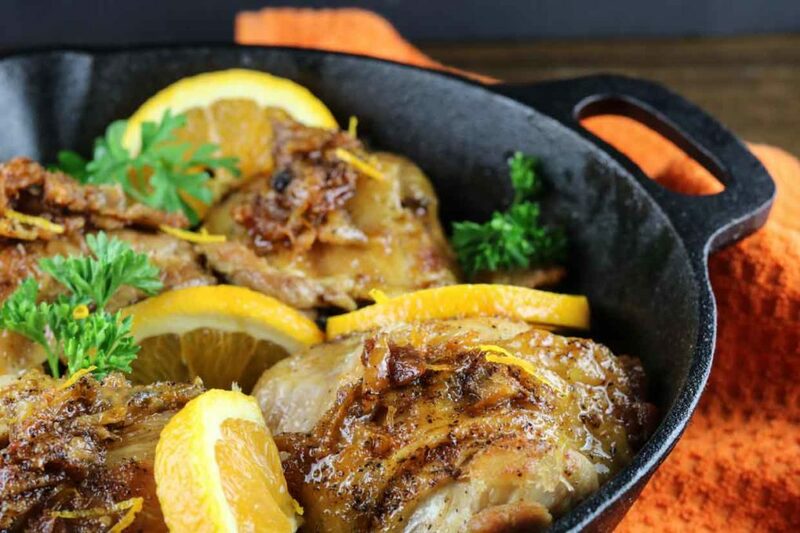 Orange is probably one of my favorite glazes to use with meat so it should be no shocker that I’m bringing you yet another DELICIOUS orange glazed chicken recipe. It makes me so happy to develop tasty, sweet glazes that don’t require any refined sugars or high fructose corn syrup, I mean that’s like a win in and of itself. I could have eaten all four of these but I refrained. The key ingredient in this glaze is again going to be coconut aminos and orange juice (similar to the Paleo Orange Beef I shared earlier this week). If you can’t find any at your local grocery store, you can pick some up over on Thrive Market. Right now you can get a FREE jar of Justin’s peanut butter when you sign up for your Thrive Market membership. Thrive is also my favorite place to pick up some large jars of ghee, another ingredient in this recipe. I always find the best price at Thrive for my ghee. But seriously, pick up some coconut aminos STAT and start making some of these delicious glazed recipes! 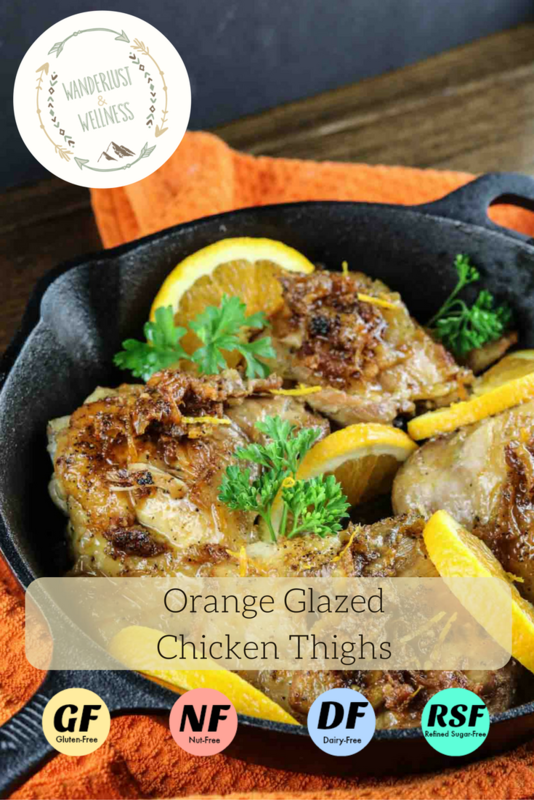 The glaze on these chicken thighs, combined with the crispy outer layer was perfection! (One note…in full disclosure, yes, those are oranges in the photos. They look more yellow, like lemons, but alas they are oranges. I’m still learning with my photography skills.) Now let’s get to the recipe! In a large skillet, melt the ghee over medium heat. Add in chicken thighs and cook through until done, turning every 3-4 minutes. While chicken is cooking, combine orange juice, broth, sugar, coconut aminos, sriracha sauce and stir to combine. 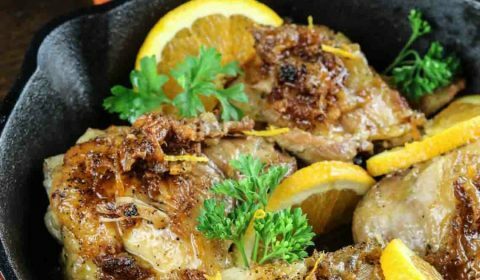 Once chicken is done, remove from the pan and place into a baking dish. Scrape the pan to loosen any crumbs, but leave in the pan. Add in garlic and orange zest and stir until they’re lighting browned. Add in liquid mixture, turn heat up to high and bring to a boil, stirring constantly. Cook for about 10 minutes or until the liquid thickens into a glaze. Pour glaze over chicken and serve.